We want to say thank you to every single one of our great fans in Winnipeg for once again, rockin’ the house and helping us create an unforgettable night of R&R memories. This final year has been pretty special so far and Thursday night was no exception! Our thanks to Jay Pauley and his staff, the legendary Howard Mandshein for creating the perfect setting to build a rock and roll night to remember on and, to everyone of you who came by to say hi at the meet and greet after the show. 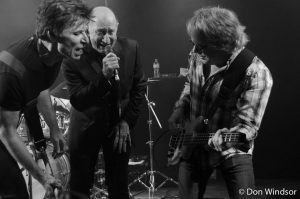 Having Streetheart alumni Ken “Spider” Sinnaeve sit in with us was a moment for the ages and certainly one of the highlights of the year for us. Thank you Spider from sharing your good vibes and your incredible talent with us. It was a great honour for us to be able to play some music with you once again! Hope you all have a great weekend wherever you are! Photo courtesy of Don Windsor.